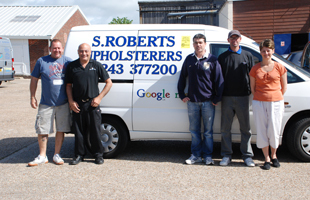 S Roberts Upholsterers is an established business that was started in 1998 by Steve Roberts, the owner. We have a large workshop that we run in Emsworth, Hampshire and take on a huge variety of Upholstery work. These range from General Domestic Upholstery to include Furniture Repairs, Replacement Foam and Feather Cushions and Loose Covers to Commercial Upholstery for Hotels, Ships, Restaurants etc. Re-upholstering and Restoring Antique Furniture is a speciality of ours using traditional materials where required. As a team we pride ourselves on being able to offer diversity to our customers. We can really achieve anything from re-upholstering a headboard to designing, making and re-upholstering new furniture. We provide a free measuring and quotation service and feel that we offer a very competitive price for the quality of craftsmanship that our customers receive. Contact S. Roberts Upholsterers Ltd today for all your upholstery repair requirements.